I saw this tuna steak sitting on the Sainsbury’s fish counter and I couldn’t believe no one had snatched it up. It was about an hour till shutting time and still it hadn’t gone! I don’t understand why. It was a big, juicy, deep red, beautiful piece of fish and you could tell it was fantastically fresh. I had to have it. 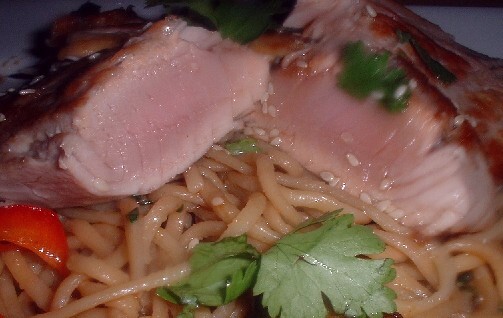 Tuna seems to be frequently reserved for asian style dishes. There’s nothing wrong with that, but I’d had a sesame-chilli tuna dish last week, courtesy of Goon, so I wanted something different. I was vaguely aware of a dish made with tuna fish and cannelli beans but my internet browsing seemed to suggest that canned tuna was the usual thing to use. Why have canned tuna when you can have lovely steak? Well, apart from the obvious price issues. I decided to make up my own tuna and cannelli bean recipe. First I made up a marinade. I mixed equal quantities of lemon juice and olive oil. The oil had come from my tub of artichoke hearts so was flavoured with garlic, herbs and had also taken on some flavour from the hearts. I also added a large crushed clove of garlic, a bit of finely chopped parsley and some tomato puree. I coated the steak and left it sitting for a few hours, covered, at room temperature since it was very cold already.This meant that by the time I wanted to cook it, it was just the right temperature. I made the cannelli ban concoction by softening some onion with parsley, garlic and thyme then adding vegetable stock and simmering it right down until thick. Then I added some chopped celery and the beans and cooked for a couple of minutes so the celery was still crunchy but had absorbed some flavour from the stock. Finally I seared the steak for just over a minute per side, and served it on the cannelli beans topped with a big chunk of thyme butter, with a side of fine asparagus tips. Not bad at all for a quick and easy meal. Shame its a bit too pricey to offer to that student magazine. As I was doing my shopping on Sunday, I saw something I couldn’t resist. A whole duck (giblets and all) for £4.50! I hadn’t particularly planned on cooking for more than one that evening but how could I not when I had this at my disposal? I also thought it was be a nice suprise for Goon when he got back from his working weekend. He seems to quite like coming home to whole cooked animal carcasses. I guess it must be a bloke thing. Recently I’ve made duck with raspberry and duck with orange. I quite fancied cherries but I was out of cherry brandy . The only fruity liqueur I could find in my cupboard was a nearly full bottle of cassis. So I went looking for blackcurrants. It seems it has got to the time of year when berry fruit isn’t readily available. So I had to get tinned blackcurrants. The upside to this was that I could make a nice blackburrant glaze for the duck. 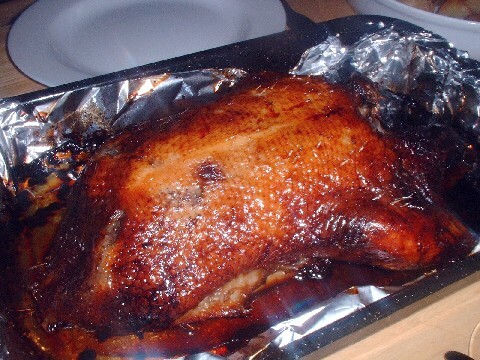 I took two tablespoons of honey and mixed it with enough juice from the tin to make a thick paste then smeared it over the skin and in the cavity of the duck. Then I put some crushed garlic and a couple of rosemary springs inside the duck and roasted it. Of course, roasties were a necessity. Maris piper potatoes roasted in goose fat are the best thing! I don’t know why goose fat is so good for this but it just makes the potato edges come out all light and crispy. The blackcurrant sauce for the duck was made from simmering the blackcurrants with a sprig of rosemary in some water until the blackcurrants had softened. Then I added sugar, a glug of cassis, a few dropsof raspberry vinegar and some red wine, let it reduce down a bit then removed the rosemary, popped the rest into a blender for a few seconds and strained it. Yum yum yum! 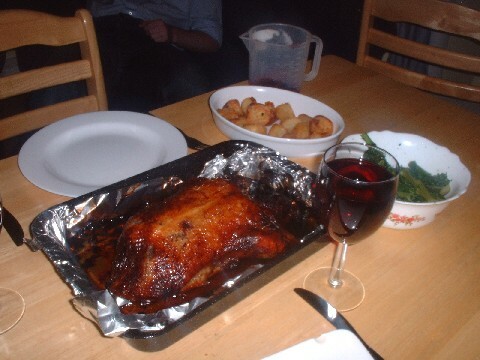 Duck with fruity sauce and roasties! You might notice my duck is not as rare as usual. This is because supermarket timing instructions are utter rubbish. It said 20 minutes per 500g- so in theory 1hr 30 for this duck. I knew that they’d be talking crap to some extent, so I took it out after an 1hr 5 and it was medium well done. I’d have destroyed it if I left it in any longer! And now for the shocker….. I made DESSERT! I finally have broken out of the savoury main meal mold. Goon read everyone’s suggestions for what to do with our excess apples and decided he wanted apple pie. And before anyone else says it, NO IT ISN’T A HEART ON THE PIE!!!! It’s an apple -can’t you see the stalk and leaf? Sheesh! . 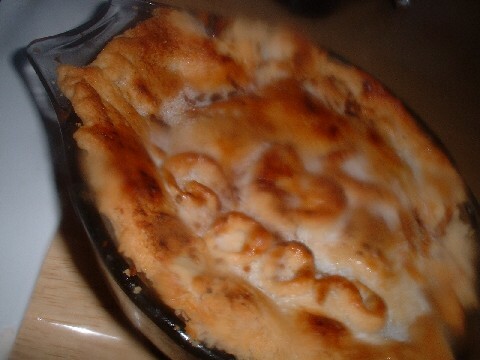 The pie got attacked and devoured before I got a proper shot of a slice, so this was the best I could do. I was very pleased with it. 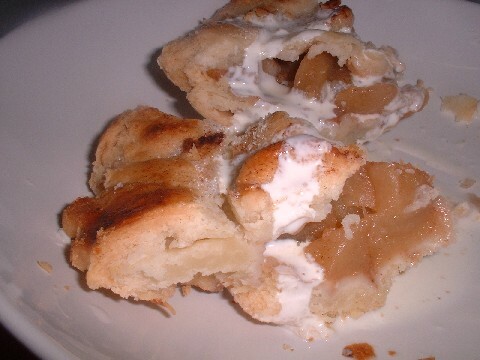 It had apple, cinnamon and honey in the filling and a sugared shortcrust pastry crust. It took up time I technically didn’t have, but it was fun to make. I really am going to have to try some of this proper baking soon. I seem to be running out of ideas for lamb kidney recipes! Guess it must be time to get some of the veal kidneys I saw at Borough instead, although I’m not entirely sure if they’re all that different. Maybe pig kidneys would be more interesting! Here is my latest offal offering. Lamb kidneys with in a red wine and bacon sauce with mushrooms and onions. Unfortunately this meal was made stupidly late as, once I’d done most of the prep work for the vegetables, we discovered our pack of kidneys didn’t smell quite right. There is no way in hell I’m risking eating offal that might be dodgy! By then Goon had his heart set on this kidney dish, so he ran off to get more. Half an hour later he was back with every pack of kidneys the shop had. Apparently Goon didn’t want to risk another pack being off. So now he has a freezer full of kidneys. Good thing we’re both offal fans. 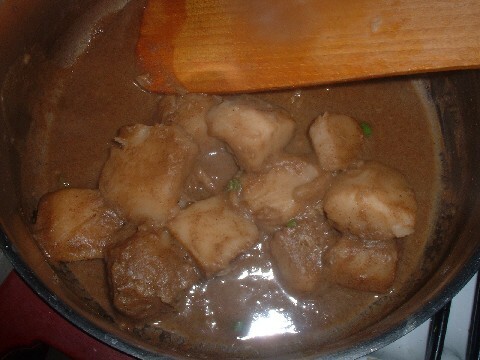 I made this dish by frying the kidneys as usual and removing them from the pan. Then I fried the onions, mushrooms, garlic and bacon until they were all cooked and deglazed with a mixture of shiraz and lamb stock. I let this all bubble down, thickened it with just a touch of cornstarch and stirred the kidneys back in. I threw in a little worcestershire sauce, finely chopped parsley and some black pepper and served it over long grain rice. It was pretty good but not quite as good as Devilled Kidneys or Rinones al Jerez. I guess those two are classics for a reason. Still, this was good for a change and Goon wolfed it down. Here is the recipe for lamb kidneys with red wine. Looks like this could become a regular feature. Goon rather enjoyed making our tuna steaks the other day and so he wanted another turn at cooking. I suggested that he use up the other half of the uber-slab of salmon he bought last weekend. Goon hasn’t really got the hang of thinking up things to do with food. He can follow recipes now, but unless someone tells him exactly what to do, he feels a little bit lost. This caused a bit of a problem as he couldn’t find any easy salmon recipes he liked online. He said he might just grill it and boil some new potatoes but I thought he wouldn’t learn much from doing that. So I had a bit of a think and came up with this for Goon to try: pasta with dill, white wine and creme fraiche topped with the grilled salmon drizzled with some olive oil and a dressed side salad. It turned out to be a good learning experience for Goon. For a start he found out that creme fraiche comes in tubs which are too small for anything useful. We had to bulk out the sauce with some single cream. I had to take over making the sauce in the end. Goon nearly tried to make it by stirring creme fraiche into the pasta and then adding half a bottle of wine. I explained that it was difficult to mix the wine and cream together after they’d been added to the pasta. Goon seemed to understand this, but when I also explained the concept of reducing a sauce to give it more flavour, Goon got scared and ran away to hide in his room. He came back when I agreed to handle the sauce and he tried grilling the salmon. The salmon worked out fine in the end but I had to stop Goon from taking it out from under the grill too early. He was bothered by the fact the skin was smoking slightly as it browned and kept turning the heat off. We nearly ended up eating raw salmon, which would be fine as I like sashimi, but I got the feeling we weren’t really dealing with sushi grade fish. Right at the end we found out that Goon had forgotten to buy salad , so we ended up having a side of salted, buttered spinach with our meal. It wasn’t bad for such an easy thing to make. I think it would have been even better with something a bit tangy added to the pasta. I thought chopped gherkins at first but they’d be a bit overpowering. Capers maybe? I think Goon is improving. What shall I get him to try next? If you look down the comments on the ‘About’ page here you’ll see a message from a lady called Jane asking me if I was interested in writing for a student magazine. Needless to say, with my current restricted income, I was VERY interested in doing this, especially since I write about food on a daily basis anyway. Hang on. Is this the stuff I’m supposed to be doing? I wondered if Jane had actually looked through the site because I can’t recall the last quick and easy recipe I posted. Most of my cooking takes about two hours to complete. True, the double G&Ts slow me down somewhat but the timings hardly compare to using a stir in sauce. And what does easy actually mean? If the average student is anything like the engineering undergrads I teach, I’d expect them to find operating a microwave a serious challenge. But that would rule out pretty much any recipe worth writing down. Spicy breaded turkey cutlets. Cheap, easy and sort-of quick. Plus its a good way of getting rid of unused bread. The idea is simple. You take these thin turkey steaks, brush them with tomato puree, coat in egg and cover with a mixture of dry breadcrumbs, cayenne, paprika and mixed herbs then fry until cooked. They go pretty well with some cous-cous and courgettes. The turkey only takes a minute or two to cook and the preparation time would have been about 15 minutes had I not been cleaning the kitchen whilst cooking. The pack of turkey, which cost £3.60, would feed three or four easily and the spices hardly add anything to the cost. So I estimate that with a fairly simple cous-cous and courgette accompaniment the price would be around £1.50 for a large meal. Hopefully it will do for the magazine. I have some turkey left so I might try again at the weekend and see if it can be improved. I think maybe getting some tomatoes and making a garlicky tomato and courgette salsa might work. Now I just have to think of one more. Maybe this should be a long slow cook recipe that can be left in the oven while the student goes down the pub. Hmmm….. It makes me happy. So do my new ruby coloured glasses. True I have a child’s taste in drinks, but I love this sparkling Shiraz the Aussie winemakers like to produce. The Hardy’s version has been on special offer recently and so I grabbed a bottle. This stuff is best served lightly chilled and is lovely and chocolately but still fruity in a forest berry kind of a way. It makes me very tipsy indeed. Probably because I drink it so bloody fast! I was intending on heading straight back to my place but I thought, “What the hell,I’ve got nothing to do tonight” and replied enquiring what I should pick up to cook. This suprised me a lot. So much so, in fact, that I choked on my last sip of tea and ended dribbling down my front. Nice way to keep the respect of your students. Needless to say Jamie found it hilarious. After explaining the situation to him and his mother (and describing Goon’s previous cooking attempts) they suggested I get back to Hammersmith very fast to stop him. Unfortunately, due to London’s horrendous, dysfunctional transport system, the quickest way from Parson’s Green to Hammersmith is to run. The second quickest way is to walk. This is in spite of the fact that there are two direct buses. I managed a mixture of both. Forty-five minutes later I was at Goon’s flat looking dubiously at some tuna steaks being marinated in chilli oil. Goon was attempting something that, in my opinion, restaurants rarely get right: seared tuna steaks. 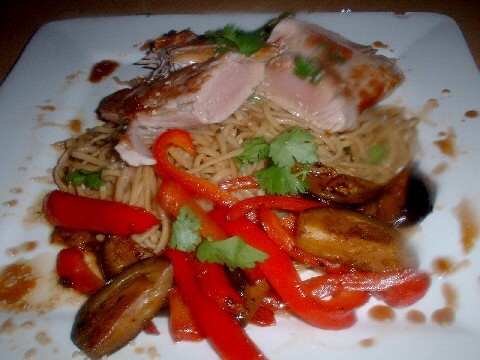 Apparently Goon had been reading some blogs I link to when he found Julia’s post on seared tuna steak with peppers and noodles. He thought it looked simple enough for him to try and went to buy the ingredients. Since he had other suitable ingredients about from the Thai Salmon the other night, I tried to convince Goon to jazz things up by making a honey and soy dressing for the tuna. This idea turned out to be too scary for him so I made the dressing and got him to toss some spring onion and coriander in with the noodles. In the end it would have gone very well but Goon was obviously reading instructions on how to cook tuna steaks twice as thick as the ones he bought. I saved two of them when I saw him trying to cook them for two minutes a side. The other two, unfortunately, I didn’t see until it was too late. Goon reduced the cooking time to 1 min 15 per side but the steaks were very thin and still dried out. This was the best of the four steaks. It was cooked for 1 minute 15 per side and rested for five minutes. Not bad going for a goon! Goon was a bit upset that two of the steaks hadn’t worked preoperly but I think he did pretty well considering that whenever I order ’seared’ tuna in pubs, it arrives cooked to a crisp. But of course, there isn’t an evening that goes by without Goon being a goon. Last night, he turned on the taps in the kitchen then wandered off and forgot about them. Not very long after his front doorbell rang and the ladies living downstairs informed him that a lot of water was coming through their ceilling. It seems he had flooded his kitchen. And the one downstairs. Well, what do you expect in a place where the most frequently cooked meal is pasta with Tesco value stir in sauce? I should have known better. When I was asked to cook a Sri Lankan style curry in the Latymer Court kitchen, it should have been obvious that I’d also have to provide the necessary equipment. But in my mind, every kitchen comes with a pestle and mortar and at least four decent sized pans that aren’t covered in rust. So cooking the curry turned out to be a LOT more difficult than expected. The pan problem was easily sorted out by cooking two things at a time and using the oven to keep things warm. The spice grinding problem was a little more tricky. Freshly ground roasted spices are the most important ingredient in a Sri Lankan curry. They’re what makes the flavour so distinctive and without them I think there’s little point in bothering. So the lack of pestle and mortar was causing me some serious issues. I went to use the blender but, in the shock of being used for the first time in 8 years, it immediately blew a fuse. We ended up resorting to making Goon grind the spices with a wooden spoon and a ceramic breakfast bowl. Needless to say, the curry powder was a little more chunky than usual but at least the flavour was still good. The next problem was stopping the ingredients from walking away. The Latymer Court kitchen is small and cluttered and, to make it worse, someone had obviously been tidying when I wasn’t looking. My coriander vanished without a trace and never reappeared. So the lamb curry was on the chunky side and the breadfruit curry was a bit plain from the lack of coriander. Luckily breadfruit is fantastic on its own because of its amazing gooey texture which made it one of my favourite treats as a child. At least I can say that the mung-atta kiribath went without hitches. I’m sure I’ve posted about this before but possibly back in the days when absolutely no one read my blog. Kiribath is a traditional Sri Lankan dish of rice cooked in coconut milk. This coconut makes the rice sticky so it can be formed into a ‘cake’ and cut into pieces to serve, It can be made sweet or savoury and has lots of variations. My favourite way to have it is with loads of garlic and black pepper added. I also add mung beans to give a more interesting texture. So, we got there in the end and had Sri Lankan style lamb curry with mung-atta kiribath and curried breadfruit. Here is the sri lankan lamb curry recipe.